There's a Science Venture Event this week happening at the University of Victoria, in Victoria BC. Innovation Exploration is a two-day event celebrating the winners of the BC / Yukon regional Science Fair. The event is hosted by the BC Innovation Council. The program will include a morning at UVic for seventy middle and high school students from across the province who are regional winners of science fairs. The program involves a dinner, tour of VIATEC, the Proteomics Lab, and the morning of October 25 on campus. At UVic, the students will attend workshops from 10 a.m. to 12:30 p.m. delivered by faculty and students. The programming for these workshops is arranged by Science Venture, under the guidance of Melisa Yestrau, director. Most of the members of the Science Venture team at UVic are undergraduate students -- most of them are between 17 and 21 years old. They are learning to write about and present science for kids. The team works to stimulate an excitement for engineering, science and technology in today's youth by providing high-quality, hands-on happenings and science adventures for children from 5 to 18 years old. The UVic presenters on Tuesday, Oct. 25 are: PhD candidate Veronika Irvine (Computer Science); senior lab instructor Duncan Johannessen (Earth & Ocean Sciences); Karl Makepeace (UVic Proteomics Centre); BSc student Stephanie Robertson (Engineering); PhD candidate Jenni Woodcock (Computer Science) as well as Drs. Stephanie Willerth (Biomedical Engineering) and Peter Wild of IESVic (Engineering). 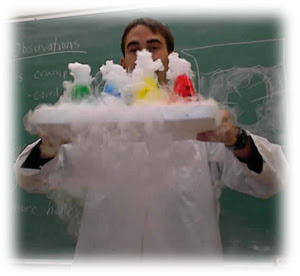 There's more information about the Science Venture team at http://scienceventure.uvic.ca/ . The two images on this post are from the Science Venture website. Science Venture goes a long way to make science-related activities available to young people, particularly girls. Some of the activities of the clubs associated with Science Venture team can be seen online at http://www.greengarageblog.org/2010/02/24/breaking-down-barriers-uvic-ecocar-mentors-the-science-venture-girls-club/ or http://www.westcoastaquatic.ca/NCNsciencecamp.htm or http://uvicecosat.org/outreach.html -- check them out! Astronomy has intrigued me since I was a young girl staring out the window on long drives. At that time, I knew how to find the Big Dipper and Little Dipper but not much else. Curiosity led me to hop on my bike and pedal to the County of Strathcona Library. For reasons no longer remembered, I visited the adult shelves and took out books far beyond my level of comprehension. Comparing images in the books to objects in the heavens left me feeling there were too many dots on the page and too many stars in the sky. I imagined constellations all over the place but was never sure I was seeing the same group of stars as in the books. Finally as an adult, I learned to find my way around the night sky. At one point I remember thinking, “if only you could connect the dots in the sky, it would be easier to find the constellations.” And that’s how my Dot to Dot in the Sky series was born. The first and fourth books in the Dot to Dot in the Sky series show how to jump from one star group to the next. Stories in the Stars focuses on 15 easy-to-find star groups. 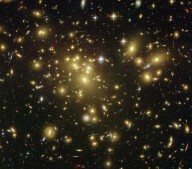 They are easy to locate because they either contain bright stars or are near constellations with bright stars. Stories of the Zodiac explores the 12 constellations that the Sun appears to travel through when viewed from Earth. These books also share the myths, legends, and folklore that ancient cultures told to explain the gods, goddesses, heroes, monsters, and other characters in the sky. While it's fun to search for constellations, it's also important to note that these star groups are more than pictures in the sky. They represent stories from many different cultures and are also important because they serve as a celestial map. Astronomers refer to zodiac constellations when describing the location of the planets in our solar system. Constellations are also useful for navigation. Just think of the North Star! You may wonder why it’s important to study astronomy. Does it really matter what’s up there? Yes it does. Here are just a few reasons. Studying the Sun helps scientists understand the life cycles of other stars. This knowledge helps scientist learn how to predict celestial events that could impact Earth. Our Sun is the closest star to Earth at only 93 million miles away. It is responsible for life on Earth and provides our energy, our atmosphere, and all our weather. Solar flares impact radio transmissions. Activity from the Sun can interfere with Earth-orbiting satellites, power grids, and global positioning system (GPS) measurements. The Sun, as well as the Moon, causes Earth’s tides. While I've learned a lot since those nights staring out the window on long drives, I still feel the same awe I did as a child—wondering about everything in space. But now the night sky is more familiar. I look up and see characters in the night sky. I know how to use the constellations to locate planets. And thanks to the important work of astronomers and other scientists, I know the Sun is responsible for much more than sunny days and the constellations are even more than a wonderfully entertaining way to enjoy the outdoors. Yes, As a Matter of Fact. Grammar IS Important in Science. When I was in grad school, I worked part time as a teaching assistant. One semester, I gave my lab students a vocabulary quiz in the form of a crossword puzzle; they responded with unanimous outrage. As one put it, "I didn't major in science because I wanted to worry about my spelling." I couldn't quite convince them that spelling is as important to scientists as to people in any other field. After all, mitosis and meiosis differ by only two letters; biologically, they differ by amoebas and humans. Grammar can be another sticking point for students. When I took marks off their papers, they'd often say, "Oh, but you knew what I meant." Maybe. But the job of a writer (and a scientist) is to make sure the reader doesn't have to guess. Fortunately, there's now hope for the grammatically-confounded scientist. Dr. Lorraine Lica has created a wonderful web page explaining why "that" and "which" are not the same, and why you should care. And then she explains how to use them. With the help of set theory. And Venn diagrams. I may just have died and gone to geek heaven. This Hour Takes 22 Minutes. Off Your Life. News. Sit-Coms. The Discovery Channel. The latest "reality" drama. No matter what you're tuning in to, you might want to turn it off. According to a new study, television does more than rot your brain: it shortens your life. A group of Australian scientists collected data from more than 11,000 people over the age of 25. They compared the number of hours people spent watching TV every day to the number of years people lived. The results were shocking. A person who watches 6 hours of TV per day lives, on average, 4.8 years less than a person who watches no TV at all. Every hour of TV watched after age 25 is associated with a decline in life expectancy of 22 minutes. That's right - watching 6 hours of TV per day appears to be as dangerous as lifelong smoking. And if you're thinking that no one watches 6 hours of TV per day, you're wrong - the average adult in the USA watches about 5 hours a day. That's 35.5 hours per week spent watching TV. Or put another way, almost as many hours as a full-time job. It might be a little soon to go throwing away your remote control. This study demonstrates a negative correlation - in science-speak, interdependence between two variables. 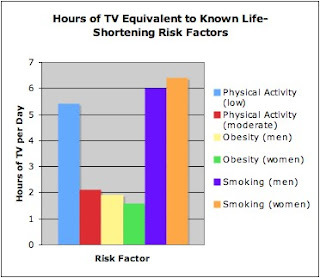 In other words, as TV-viewing time increases, lifespan decreases. That doesn't mean that television, in and of itself, is directly responsible for early death. Correlations are not the same as causes. Indeed, two correlated variables may in fact be responding to the same underlying-and-as-yet-unidentified cause. In the case of this study, that cause is most likely sedentary behaviour, also known as too darn much sitting around. And that sitting isn't just done in front of the tube. It's at work, in the car, eating at restaurants and typing out emails. Excuse me. I have to put my laptop down now, go out, and take a walk. I live a world away from Alberta, in posh, ivory-tower Toronto. It's hard to really know the truth about the oil sands/tar sands here (take your pick of the terminology; which you call it reveals your attitude, pro or con). I can tell you, though, that the Lululemons in my 'hood unanimously and vociferously decry them (but then drive off in their X5s). As a science writer, I know the world is not a chic but simplistic black-and-white. I know, for example, that as feel-good as it is to tsk tsk fossil fuels, I wouldn’t - couldn’t - live in Canada without oil. I’m fond of my furnace come October. So until that magic day when we can switch over entirely to non-carbon fuel sources, I’m going to have to accept that oil and I are partners in the Canadian experiment. But that’s not to say I’m not uneasy about it. It’s also why I jumped at the chance to see the oil sands for myself last June. As part of the Canadian Science Writers Association’s annual meeting, a trip to Fort MacMurray was offered. I signed up pronto. The day was warm as we boarded the private plane provided by Connacher Oil and Gas, one of the gazillion oil companies based in Fort MacMurray. Connacher is at the forefront of in situ mining, a method of oil recovery that only became viable in the last decade. Traditionally, oil sands were obtained through open pit mining – huge quantities of the bitumen-rich soils were scraped off the surface of the land for later extraction. This process certainly left large areas of the landscape in bad shape, and potentially exposed populations downstream to toxic wastes. Only a fraction of the oil sands – those that lay on the surface –could be mined this way. But much greater quantities of oil – unbelievably huge reservoirs that make the Middle East's reserves look like duck puddles – remained inaccessible. Technology to access them simply did not exist until the 1980s, when a technique called SagD (Steam Assisted Gravity Drainage) was developed and proven. With SagD, hot water is pumped into underground reservoirs that contain the thick, tarry oil sands. The steam loosens the tar, enabling it to be pumped up to the surface, where it can then be refined. ﻿SagD seems to have a much more limited impact on the environment than traditional open pit mining. The footprint of the wellpad is tiny; to my eye, about the size of an average high school gym. The official bumpf says the pads cover 85-90% less surface area than old style mines. The Connacher plant also recycles over 90% of the water used to make the steam, using only non-potable water; it doesn’t draw water from the nearby surface water or rivers. The company also generates its own energy, making it largely independent of the power grid. I have to say I was impressed by the facilities we toured and the caliber of the Connacher staff we met. Like most Canadians, the engineers at Connacher were concerned with the environment, and proudly detailed for us the programs they had in place to ensure as little disruption as possible to the wildlife of the area, and the environment overall. Our guides were not given an easy ride by our group of science professionals and journalists, which included Jay Ingram, longtime host of Daily Planet, Susan Eaton, geologist, geophysicist and committed conservationist, and award-winning science journalist Peter McMahon. They were given tough questions to answer, and were not allowed to avoid them or slide away with easy generalities. 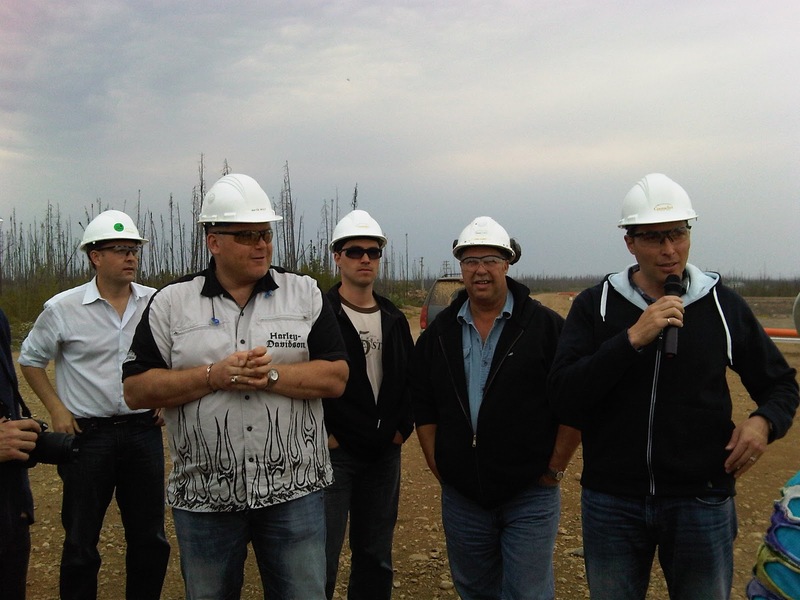 Is SagD perfect? Of course not. It still is releasing carbon into our atmosphere, which we all know is damaging. And there are still local environmental concerns that need to be addressed with stricter regulations and monitoring. After the visit to Ft. MacMurray, the issues around the oil sands were clearer in my mind. Like Patrick Moore, I now believe that Canada, as a nation, cannot, and should not, put a stop to oil sands extraction in Alberta. We simply have no alternatives to oil yet. Until we do, we have to get our oil from somewhere. Like the folks at Ethical Oil say, where would you rather get your oil, from Canadians who are regulated and who make the effort to obtain the oil in the cleanest possible way (no matter if we don’t always reach nirvanic perfection, at least we are trying – can you say the same about Venezuela?)? Or would you rather buy your fuel from a country where women aren’t allowed to drive, or vote, or get stoned to death if they look at a man that isn’t their relative? Not me. I’m going to continue to use as little fossil fuel as I can, because reducing its use is good for everybody. But until I can honestly live without fossil fuels, I’m going to support the firms and countries that are more in line with my values of environmental conservation and human rights. That means Canadian oil. I’ve been reading and writing about eyebrows this week. I’m learning a lot. It has made me think, with amazement, how human beings (like me) are so oblivious to our own biology in so many ways. I mean, eyebrows are just two strips of hair; they’re kind of boring, perhaps even a little gross. Even though I look at eyebrows dozens or even hundreds of times a day, I’ve never paid them much attention before. All this time, I had no idea how important they are to everyday life. Eyebrows talk, and we are very good at understanding what they are saying, without thinking. But there is more. 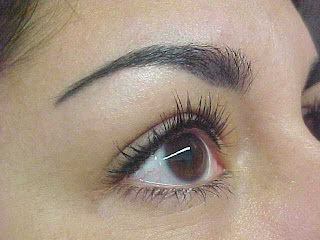 Eyebrows are crucial for us to recognize faces and determine the identity of its owner. That is one reason why we first look at the eyebrows and eyes when we see a face. 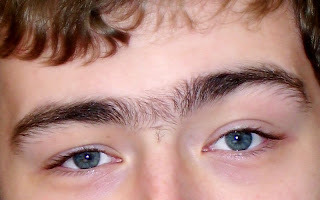 People’s eyebrows give us even more information – whether they are male or female, and to some extent how old they are. We also seem to read information from eyebrows about people’s personalities, though there is no evidence (and it is unlikely) that eyebrow shape and personality are actually related. We judge a face with thin eyebrows to be happier, weaker, and more intelligent. Thick eyebrows are judged as stubborn, strong, even mean. This makes me wonder if there is a biological reason for people in so many cultures, especially women, altering their brows to make them thinner. Could it be that we are unconsciously changing what our faces communicate to the world? So here I am, looking at my own eyebrows in the mirror several times a day, using them to detect the emotions and identity of the faces of everyone I meet, and moving them up and down and in and out to send signals to people without being aware of it. My mind pays attention to eyebrows when I’m speaking to people and when I’m watching actors on a screen, and registers and understands the signals they convey without my knowledge. My conscious mind can try to fake emotions using my eyebrows, but this uses a different part of my brain, and like most of us I am not very good at faking it. The movements we make when deliberately “making a face” are faster, bigger, and last longer. Most people have little difficulty telling the difference between when we are faking a frown and when we really mean it. Studying the science of eyebrows has made it very clear that my brain is causing me to behave in ways that I do not know about. This makes me wonder what else I’m doing that I have no control over. It makes me uncomfortable to think that I’m an animal, a product of evolution, and that I respond to my environment – including other people – in such complex ways without my knowledge. It is also marvellous to realize how little we understand about our own biology. Eyebrows are right under our noses (well, actually above our noses), are utterly unique to our species, and yet are not fully understood. From a purely selfish perspective, this means there is plenty of intrigue and mystery left to explore, and plenty still to write about.